It's made of aluminum construction waste from temporary housing built in the aftermath of the 2011 Tohoku earthquake and tsunami. TOKYO, Japan — The Olympic torch of the 2020 Summer Games was unveiled Wednesday during a press conference in host city Tokyo, Japan. It'll soon become the centerpiece of attention in the months leading up to the Games' opening, scheduled for July 24, 2020. 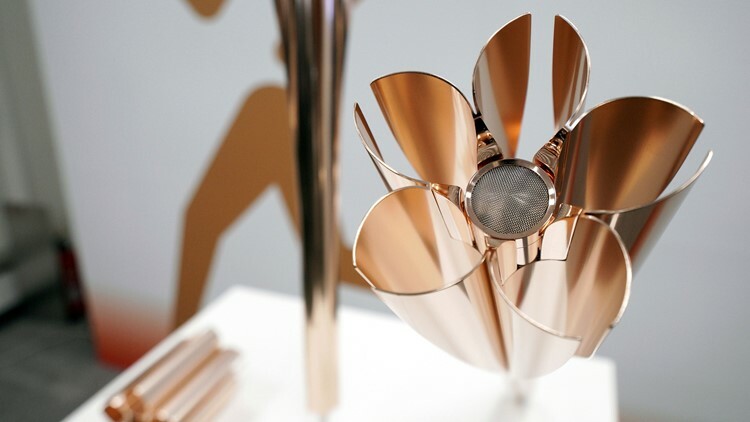 The torch is designed to resemble a cherry blossom, embodying a centuries-old symbol of Japanese culture. Highlighted by a traditional "Sakura-mon" flower crest emblem, it's made of aluminum construction waste from temporary housing built in the aftermath of the 2011 Tohoku earthquake and tsunami. Translated to English, the Games' relay concept is "Hope Lights Our Way," and is described by organizers as a way of hope. "The light of the torch that connects, supports, acknowledges, and enhances each other is the sunrise of a new era and illuminates the path of hope for the people," the concept reads. On hand for the unveiling Wednesday was judoka ambassador Tadahiro Nomura, a three-time Olympic champion. He won gold in 2004, 2000 and 1996. The other 2020 Olympics torch relay ambassadors are three-time Paralympian Aki Taguchi, actress Satomi Ishihara and comedy duo Sandwich Man. Less than a year from now, on March 12, the torch will be lit by sunlight in front of the Temple of Hera at the site of the ancient Olympics in Olympia, Greece. A Greek relay lasting eight days will commence in Athens on March 19. From Greece the flame will be flown to Matsushima Airbase and publicly displayed from March 20-26 in the Japanese cities and towns of Ishinomaki, Sendai, Kamaishi, Hanamaki, Ofunato, Fukushima, Iwaki, Naraha and Hirono. On March 26, the Olympic torch relay will officially kick off within Japan's Fukushima prefecture. All this coinciding with the start of cherry blossom season. The flame section of the Olympic torch of the Tokyo 2020 Olympic Games is seen during a press conference in Tokyo Wednesday, March 20, 2019. The torch will leave there March 28 and travel to 45 other Japanese prefectures or unique locations over the next two months until arriving in Tokyo on July 10, two weeks before the 2020 Olympics' Opening Ceremony on July 24. Such tradition of a modern torch relay began with the 1936 Olympics in Berlin, Germany. The idea of readopting an Olympic flame to burn for the Games' duration was first introduced at the 1928 Olympics in Amsterdam, Netherlands. The torch relay emblem features a tilted square shape with a blurred, flame-like top, and a "ukiyo-e" woodblock printing technique. For now, the torch remains unlit, as evidenced by the tweet below. But soon, its light will illuminate, signifying the forthcoming start of the 32nd Olympiad. Tokyo Skytree, the world's second tallest structure after UAE's Burj Khalifa, was lit up Wednesday in the color of the Olympic torch. The 2020 Olympic Games begin in less than 500 days.